A Woy Woy amateur photographer who has been taking pictures of spiders over the last five years has played a part in discovering at least four new species. “I was contacted by an entomologist, Michael Duncan and an environmental scientist, Philip Price,” Mr Dowe said. “Together with another local photographer, Adam Fletcher, we formed Project Maratus,” he said. “By pooling our knowledge under Michael Duncan’s guidance, Adam and I have become citizen scientists and Project Maratus is now in its third year,” Mr Dowe said. He said the non-profit, self-funded group played a vital role in understanding the evolution and ecology of peacock spiders. The field work was primarily undertaken in spring, when they looked in different areas to establish what species of peacock spiders there were and in what numbers. “In the course of our travels, we have discovered four, maybe five, new species. “In this way, we have widened the known distributions of some species,” Mr Dowe said. 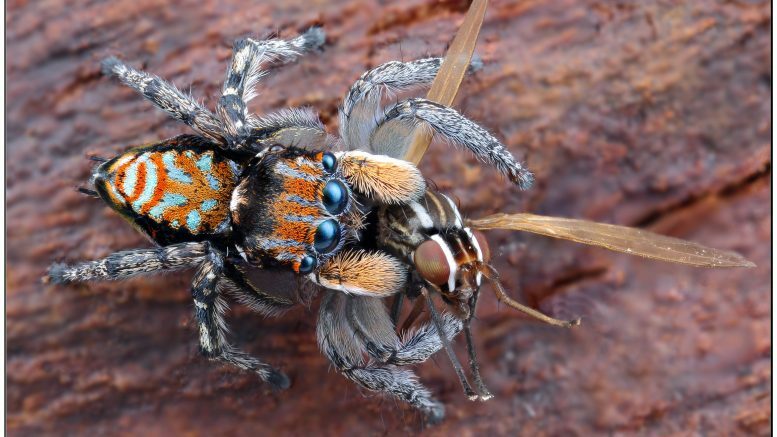 The Central Coast has five species of peacock spider: maratus volans, maratus splendens, maratus plumosus, maratus.velutinus and maratus anomalus. “The males gain their colour on their final moult when they reach maturity. “They have flaps on their abdomen which open, displaying their brilliantly coloured patterns and they use elongated third legs as part of their courtship dance for the female. “On average, these spiders are 4 – 5 mm in size, some smaller, some larger,” Mr Dowe said. Mr Dowe’s photographs have received social media attention because of a technique known as handheld photo stacking. “Most of our members are photographers and mostly use the Canon MPE 65mm macro lens. “With its high magnification, the depth of field is very shallow. “This technique involves taking several images at varying depths of field and combining them to make one image with a greater depth of field. “During the cooler months when the spiders are not so active we undertake community talks on peacock jumping spiders and mount displays at science fairs, local family fun days and the like. “One of our important aims is to educate people, particularly children, about these uniquely Australian spiders”, Mr Dowe said.